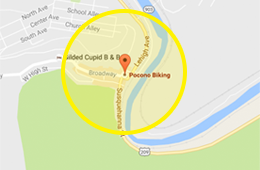 Pocono Biking located in downtown Jim Thorpe is open today for hourly and full day bike rentals. Just arrive anytime between 10am and 5pm to pedal the trail at your own pace. We have a variety of Trek bicycle rentals available for the entire family. We have comfort bikes with wide forgiving seats, multiple speed bikes, upright comfortable handlebars, kids bikes, trail-a-bikes, cabooses, and mountain bikes. Helmets are free with your rental and trail maps are provided to everyone. 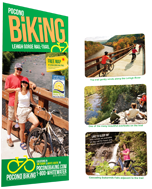 The Lehigh Gorge Rail-Trail provides scenic traffic-free riding for up to 36 miles along the Lehigh River. Click here for the shuttle schedule.